The name Glenmorangie is believed to derive from either Gaelic Gleann Mòr na Sìth “vale of tranquility” or Gleann Mór-innse “vale of big meadows”) is situated in Tain, Ross-Shire, Scotland. Owned by The Glenmorangie Company Ltd.
Glenmorangie is categorised as a Highland distillery and boasts the tallest stills in Scotland. Their long copper necks stand at 5.14 metres (16ft 10 1/4 inches), the same height as a fully grown adult giraffe! Which means that only the very lightest and purest vapours make it to the top, giving a smoother, more elegant whisky. Glenmorangie select the finest oak casks in which to mature their whisky and then only use each one twice for Original (whilst many others use their up to five or six times), ensuring that the maximum amount of flavour is always extracted during maturation, delivering a rounder, smoother taste. Having pioneered extra maturation over 20 years ago, Glenmorangie whisky creators continue to travel the world in their search for exceptional casks. 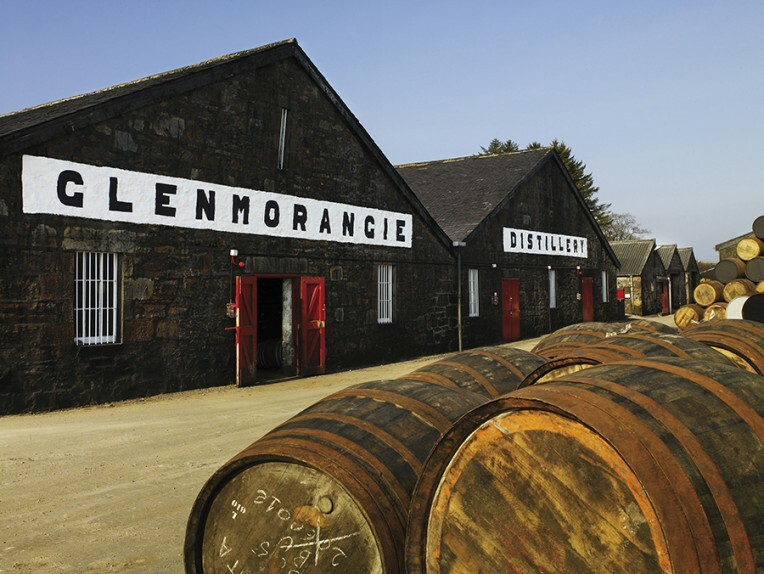 Casks that will provide additional, intriguing layers of flavours to the original character of Glenmorangie. available in Original, 18, and 25 year old bottlings, special cask bottlings, cask finishes, extra matured bottlings, and a range of special edition bottlings. Owned by LVMH, who also own the Ardbeg Distillery on Islay and SMWS based in Leith, Edinburgh.